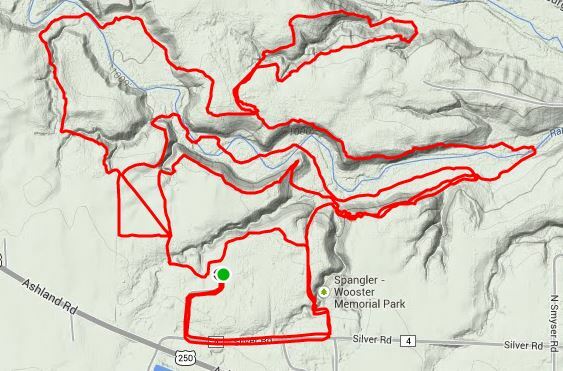 Last Saturday I took my long run to the trails and raced a 5k and 15k down in Wooster at the Spangler-Memorial Park. Considering I spent almost every other weekend in Wooster for two years, I thought I’d have a pretty good understanding of what the lay of the land would be like. I was wrong. Memorial Park was way out of town and much more technical than I expected. I got to the park around 7:30, stretched for a bit, and ran into an old Muskingum classmate. The 5k started at 8:00 and had a pretty good turnout. We were told the trails were muddy from the rain all night/morning and the bridges were pretty slick. Once everyone was lined up, we were off. I started out with a 9:40 pace and quickly lost satellite when I entered the woods, so my pace was not recorded accurately. The first two miles were all single track and we started with some smaller hills, and followed it with a long downhill that was a little too steep to take at a normal speed with the mud. I slowed down a bunch here, but was able to pick up my pace once I got to the bottom. After the first mile everyone spread out and I ended up alone. I had a few people behind me, and one person in front of me, just almost out of eye sight. We continued with more hills including a major hill along a ridge where everyone started walking. The trail was wet, but not as bad as I had expected it to be. There were were a lot of rocks and roots so I kept my eyes on the ground most of the time, but when I got a chance to look up, the views were amazing. There was so much green and the trees had a way of wanting you to get lost in them. There were also sections of fog that were picture perfect if I had my phone with me. Right around mile two, we came out into a field and I noticed that my time was right around my normal finish time. Talk about a huge difference between road and trail races! We continued in the field for about a half mile, going back and forth. My pace was able to pick up some, but I thought it was harder on the legs because of the bumps in the grass. We came back into the woods and made our way to the final half mile. The trail wasn’t as technical so I felt more confident with my stride. We had one final hill before we finished near the parking lot. I came in and picked up my stride as I clocked my slowest 5k ever. I had about 15 minutes between the 5k and the 15k so I fueled up, stretched and rolled my legs. My right calf was pretty tight from the hills so I was a little concerned how it would do during the next race. Luckily after stretching and rolling, my legs felt pretty fresh. We lined up, had a short chat about the course and were off. The first half mile was on pavement which felt amazing! I was at a sub 10 pace and knew this was the only time I’d have any sort of speed for the next hour or so. After a half mile we were back on the trails and I quickly slowed down. I’ll be honest, the miles in the woods all blurred together and since I spent most of my time staring at the ground, I don’t remember much from each mile. I do have moments that stuck out to me that really taught me how different trail racing is compared to road racing. Within the first two miles everyone had already separated and I found myself with two other runners. We spent almost the entire race together and it helped to motivate me to keep going. There were a ton of hills and running on the side of ridges. Some parts of the trail were at an angle, and some consisted of giant puddles of mud. The longer we were out there, the messier the trail became and it was hard to keep solid footing without sliding around. Thankfully I didn’t fall, but there were a few times I thought I was close. The hills were tough! My legs burned every time we had a big hill and I wasn’t ashamed of walking, just like everyone else. But once we got to the “flatter” sections, my legs felt amazing and I thought I could go on forever! We crossed streams/rivers about 7 times, with 5 of those crossings being very wide and ankle deep. Normally I would have tried to jump or find rocks to walk across. Some this was possible, others your feet were getting soaked no matter what. The last half mile of the race came out of the woods where we entered, and unfortunately I had to stop to use the port-a-potty. I had consumed so much water in the woods I didn’t think I could make it another half mile. Looking back, I probably could have, but didn’t want to be the runner with wet shorts. That last half mile though, was almost effortless. Other people were walking or shuffling, but I was kicking in my speed. I think it was obvious at this point that I was a road runner, and not much of a trail runner. 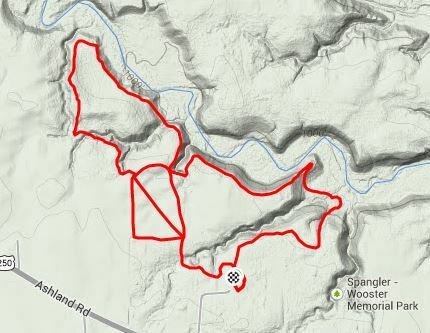 But as we made our way back into the park, I couldn’t help but smile, knowing I had just run 12.5 miles of hard, technical, single track trails and feeling like a million bucks! These races were hard, there’s no doubt about it. And this trail was the hardest, most technical trail I’ve ever run. But I enjoyed every moment of it. Yes my times were incredibly slow, but that’s to be expected. I’m not upset over my times or how I paced, but rather excited that I was able to spend some time on the trails, learning more about this side of running and letting myself go. I used to be so cautious on trails, fearing I’d fall, but this race, especially the 15k, let me relax and just enjoy the adventure. I think this was a great race and would have loved to try the other two in the series. My body is still recovering, but honestly, I’m ready to tackle some more trails! The only issue I had was my Garmin losing Satellite in the woods, which is probably a common issue. 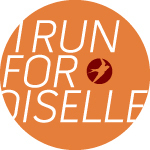 I’d definitely suggest this race if you’re big on trails. And if you’re just starting like me, I think this was a great way to get my feet wet! 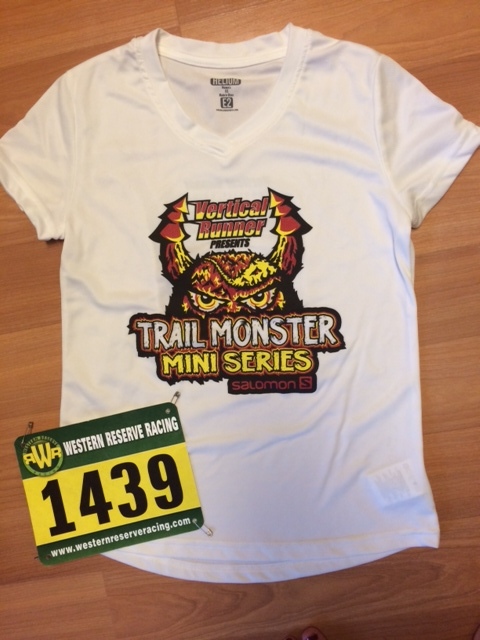 Top 5 favorite race shirts!